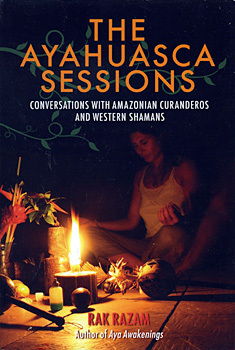 This companion to Australian journalist Rak Razam's adventure memoir Aya Awakenings features his in-depth interviews with Amazonian curanderos, Western shamans, and the seekers and thrill-seekers who travel the "gringo trail" in the jungles of Central and South America in search of a direct encounter with ayahuasca's multidimensional realities. In areas of Brazil, Ecuador, and Peru, this traditional herbal brew is used to heal physical ailments and to cleanse and purify the mind by connecting the spirit to the web of life. Razam documents the thriving business of twenty-first-century hallucinogenic shamanism from multiple perspectives, revealing the differences and similarities between indigenous and foreign approaches. Aya Awakenings includes interviews with Guillermo Arévalo, Percy Garcia, Norma Panduro, Ron Wheelock, Kevin Furnas, Carlos Tanner, Dennis McKenna, Jan Kounen, and Alan Shoemaker, among others. "To live in the rainforest is to live in harmony with the plants who are communicating with the humans." "I think the world is in serious need of healing and ... and waking up. ... The global ayahuascda movement and the rediscovery of the Archaic is an encouraging thing."